In May 2006 the General Assembly of the Church of Scotland voted in favour of maintaining an open and pastoral approach towards the marking of civil partnerships with some form of religious ceremony. It was left up to the consciences of individual ministers whether they did or did not agree to such a request, as opposed to a minister or deacon being subject to discipline for performing such a marking ceremony. This decision will be ratified by presbyteries this autumn. A failure to ratify the decision of the General Assembly will mean the current status quo remains with its uncertainty as to the position of ministers who choose either to mark a civil partnership or not to do so. Inevitably, the debate surrounding this decision was given considerable time in the media. What is the church’s position with regard to civil partnerships? Not only the papers and TV want to know, so do many ministers and church members, and, of course, the gay, lesbian, bisexual and transgendered (glbt) members of the Church. While this is going on in the Church of Scotland, many other denominations are also grappling with the question of how to be church when different groups within the church have strongly divergent views; none more so than the Presbyterian Church (USA). In his book, Jesus, the Bible and Homosexuality, ex-Moderator of the PC(USA) and Professor of Theology Jack Rogers gives a personal account of his own faith journey with particular respect to the interpretation of the Bible and the issue of homosexuality. Brought up as a conservative evangelical, Rogers became a professor of philosophical theology at conservative Fuller Theological Seminary in California. He always knew he was a conservative, though not a fundamentalist with their stricter restrictions on Biblical interpretation, such as the Bible’s inerrancy. Through a pastoral approach by the minister of the church in which Rogers happened to be worshipping, Rogers reluctantly became involved in 1993 in a task force to look into the possibility of their church, on the request of an openly gay deacon within the congregation, becoming a part of the More Light network – a network of PC(USA) churches that affirm the role of glbt men and women within their congregations. The journey Rogers takes us on is far ranging, from Scottish Common Sense Philosophy through Francis Turretin, the neo-orthodoxy of Barth and Brunner, Biblical theology and finally a return via neo-orthodoxy to the Reformers themselves. Rogers roots his understanding of biblical interpretation firmly in the Reformed tradition. 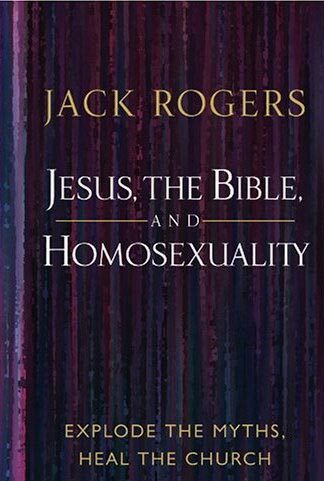 Rogers gives a clear assessment of the biblical texts most often cited in opposition to homosexuality using the Reformed standards of biblical interpretation before going on to show the pastoral dimension of his approach. It is in the personal stories that the arguments really come alive. 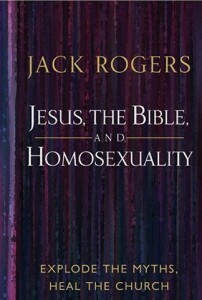 While Rogers is particularly writing to his own denomination and to their particular concerns, Jesus, the Bible and Homosexuality strikes an excellent balance between informing his readers on the theology of interpretation and keeping this theology rooted in the real world of people who are often hurt by the church’s stance on this issue. The book has much to commend itself to us in the Church of Scotland. It is instructive but also sounds a warning bell for us to be careful about bringing in restrictions on ministries and members when there is clear division amongst membership and clergy. The more permissive approach that the General Assembly 2006 opted for would seem much more sensible and less likely to result in the divisions seen within the PC(USA). This entry was posted in Book Reviews. Bookmark the permalink. Post a comment or leave a trackback: Trackback URL.